Attending a community college can be about saving money; the first two years of a bachelors program can be completed for a far lower cost at a community college than anywhere else. Graduates appreciate not starting life with crushing debt. But there are other reasons to consider community college upon graduation, and one of those reasons is work! Community colleges also provide work training and opportunities to their students who are seeking to enter the workforce right away. Picture are Ventura County General Services Agency Director David Sasek (far left), Fleet Services Manager and Oxnard College Advisory Board member Peter Bednar (far right), and program students Anahe Partida, Heather Evjen, Daniel Calderon, Matthew Gallegos and Esteban Rodriguez (L-R front row). A perfect example of this School-to-Work approach is at Oxnard College. 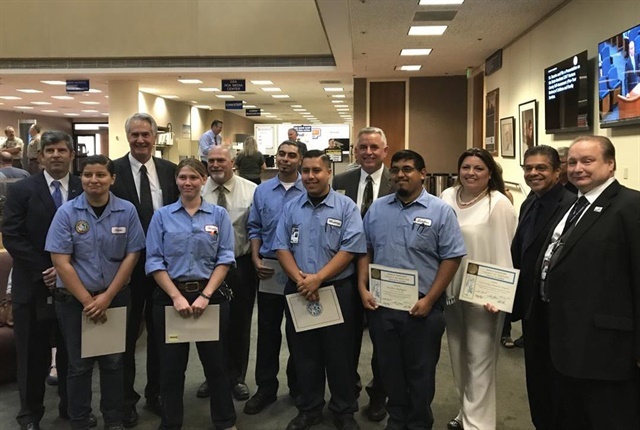 Beginning in 2015, and initiated by the hardworking faculty at Oxnard College, students in the college’s Automotive Technology and Auto Body and Fender Repair programs work four hours a day with Ventura County’s Fleet Operations Department while they attend classes at Oxnard College. Their participation gives them real-world work experience, and has the added advantage of benefiting Fleet Services and saving money. This is just one example of the multiple benefits of our county’s three community colleges. Whether you want to enhance your current skills, gain inexpensive transfer units for your bachelor’s degree, or learn valuable skills that can help you build a career right away, community colleges are back, and have a lot to offer.